The Linux build of Scream! is intended to work with many different Linux distributions. For this reason, it does not include any distribution-specific features. It is usually possible to perform a few post-installation steps which improve the integration of Scream! with the host operating system. This document describes how to integrate Scream! into the Ubuntu Dash, which makes it behave more like a Ubuntu-supplied application. The process involves downloading three files, so an active Internet connection is required. entering your password when prompted. Now open a Nautilus (file explorer) window and locate a GCF file. (You can download one from here if you don't have one.) Right-click on it and select "Open with Other Application…". Click the "View All Applications" button and scroll down to select "Scream Viewer" from the list. Click the "Select" button to complete the process. 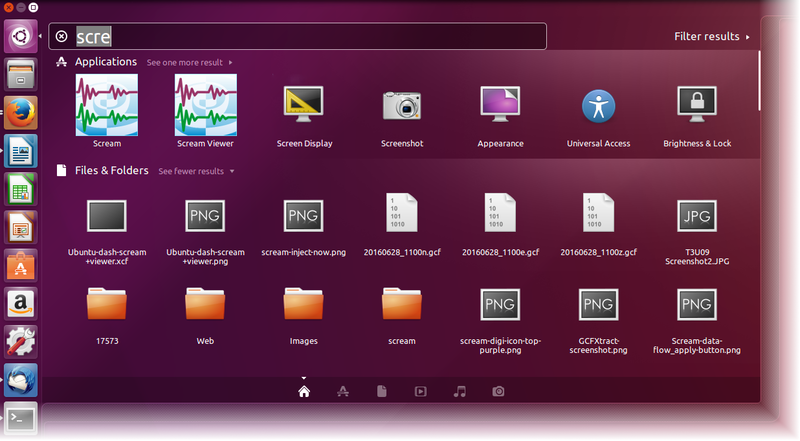 When you click on .GCF files, they will now be opened using Scream in View mode.